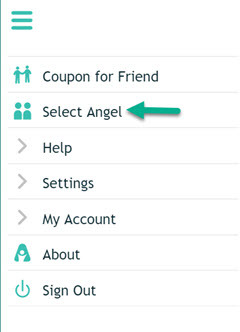 If you have more than one child ("Angel") with an AngelSense device you have the option to switch between them to view their separate schedules from within the AngelSense app. There is no limit on the number of Angels you can have in your app! 1. Go to the Menu on the left hand side and click "Select Angel"
2. Choose the Angel that you would like to view in the schedule. Done! *You can switch between Angels at any time. Switching between Angels does not have any effect on the device or you receiving notifications.